at the Bay View Apartments in Alameda. ALAMEDA CITY COUNCIL | A loophole exploited by an Alameda landlord in the days after an Alameda City Council approved a moratorium on rents and eviction was closed Tuesday night. But the action does nothing to help the 33 families who received 60-day eviction notices shortly after the moratorium was enacted on Nov. 5. 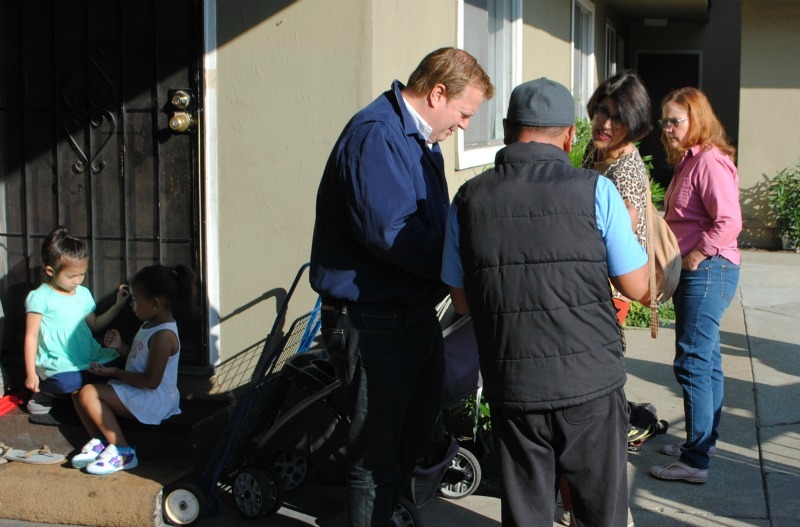 Behind the scenes, at least one Alameda councilmember had urged Sridhar to rescind the eviction notices posted Nov. 11—five days after the moratorium was in place. However, Sridhar used a provision in the moratorium allowing evictions if large scale capital improvement are scheduled for the property. Other landlord advocates tell the East Bay Citizen, they encouraged Sridhar to mediate an amicable solution at Bay View Apartments, but tenants flatly refused. In turn, some of the same pro-landlord voices have asserted the residents are being used as pawns in an effort by housing advocates to enact rent control restrictions in Alameda. Nonetheless, Laguardia and tenants advocates praised the City Council’s action Tuesday night. “It feels good tonight,” Laguardia said of the council’s decision. “It shows they are behind us.” John Klein of the Alameda Renters Coalition told the council, “You got it right tonight,” but urged for more protections for renters when the issue returns to the council in January. “We’re going to keep coming back until you get it right,” said Klein, one of two members of the tenants group who was arrested during a meeting last Nov. 4. While the moratorium approved by the council in November was intended stem rising rents and evictions along with tension among tenants fearing they will be next, Alameda Councilmember Marilyn Ezzy Ashcraft said the action by Sridhar Equities “horrified” landlords she had spoken with over the past few weeks. Councilmember Frank Matarrese agreed that the landlord’s use of the exemption undermine the intent of the council to “freeze” rents on the island. In the past, Councilmember Tony Daysog has thread a distinct line between upsetting landlords while showing concern for rising rents and eviction, despite a comment last month explaining the housing crisis as simply capitalism at work. But Tuesday, Daysog clearly signaled support for a Just Cause ordinance. “We have to do new things we haven’t done before,” said Daysog. “We have to implement a Just Cause oridnance. It has to be done.” Daysog also called for unspecified enhancements to the Rent Review Advisory Committee. In addition, the council also approved two new members Tuesday night to the rent review committee. Posted in 470 Central, Alameda, Alameda City Council, Alameda Renters Coalition, Bay View Apartments, Frank Matarrese, John Klein, just cause, landlords, rising rents, Romel Laguardia, Spencer, Tony Daysog. Bookmark the permalink.